The Type VI secretion system is composed of two sub-complexes. A cytoplasm-located complex is mainly constituted of proteins that share functional – and sometimes structural – homologies with bacteriophage contractile tail components. The Hcp protein forms hexameric rings that stack on each other to build a tubular structure comparable to the inner tube of phage tails. This tube is surrounded by a polymerized sheath composed of the TssB and TssC proteins. This sheath is assembled in a metastable, extended conformation. The tail tube/ sheath structure is built on an assembly platform called the baseplate that is composed of TssE, TssF, TssG, TssK and of the VgrG spike. Historically, we started our studies on the T6SS by focusing our attention on the membrane proteins. This membrane complex is constituted of the TssJ, TssL and TssM proteins. A former Ph.D student, Marie-Stéphanie Aschtgen demonstrated that the tssJ gene encodes an outer membrane lipoprotein (Aschtgen et al., 2008). The lipoprotein character and the outer membrane localization are both required for the proper function of the apparatus. In collaboration with the group of Christian Cambillau, we solved the structure of TssJ (Felisberto-Rodrigues et al., 2011). TssJ bears a characteristic globular transthyretin fold, composed of two 4-stranded β-sheets facing each other to form a β-sandwich. The β-sheets are connected by loops, including three large loops : β1-β2, β5-β6 and β6-β7. The structure of two TssJ homologues have been also published (Rao et al., 2011; Robb et al., 2013). Comparison of the three structures highlights differences in the protruding loop connecting β6 and β7. By contrast, two large loops, that connecting β1 and β2 and that connecting β5 and β6, have similar sizes and conformations in the three crystal structures, suggesting that may have important and conserved functions. By using site-directed mutagenesis and co-immuno-precipitation we showed that the β1-β2-connecting loop mediates TssJ binding to TssM (Felisberto-Rodrigues et al., 2011). The recent co-crystal structure of the periplasmic domain of TssM with TssJ confirmed the critical role of this loop in mediating complex formation (Durand et al., 2015). Marie-Stéphanie also characterized the TagL protein. TagL is an accessory protein of T6SSs, but it is absolutely required for the function of the T6SS in EAEC (Aschtgen et al., 2010a). TagL is an inner membrane protein with three transmembrane segments. The C-terminal periplasmic domain carries a peptidoglycan-binding motif of the Pal-MotB-OmpA family. This motif is functional as substitutions of essential residues prevent binding to the peptidoglycan in vivo and in vitro and T6SS function. Although TagL is non conserved, our bioinformatic analyses showed that a peptidoglycan-binding motif is usually found associated with a core or an accessory component of the T6SS, suggesting that the anchorage to the cell wall is required for T6SS in general to stabilize the membrane complex (Aschtgen et al., 2010b). In EAEC, TagL is part of the membrane complex via direct interactions with TssL. In 2012 we reported that the TssL protein is anchored to the inner membrane by a C-terminal trans-membrane segment, the largest part of the protein therefore protruding in the cytoplasm (Aschtgen et al., 2012). 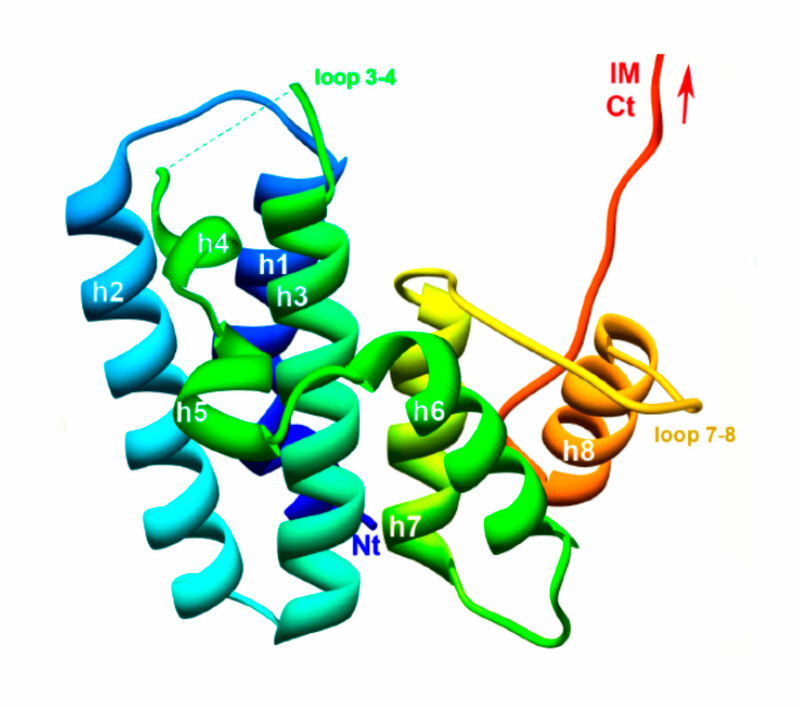 We also reported the crystal structure of the cytoplasmic domain. This domain is constituted of two bundles of three helices, the C-terminal bundle being composed of shorter helices, yielding a hook-like structure (Durand et al., 2012). We also demonstrated that TssL dimerizes. However, we observed that the cytoplasmic domain dimerizes with low affinity whereas the presence of the trans-membrane segment stabilizes the dimer. We therefore proposed a “zipper” model for the dimerization of TssL (Durand et al., 2012). The TssL protein interacts with TssM. In EAEC, TssM is a large, 125-kDa, protein that bears three transmembrane segments with a large (80 kDa) periplasmic domain. We have shown that this domain is monomeric in solution and that it interacts with the TssJ lipoprotein. Surface Plasmon Resonance studies demonstrated that these two proteins interact with a KD of 2 µM. We further defined that formation of the TssM-TssJ complex is mediated by contacts between the C-terminal 150 amino-acids of TssM and the β1-β2 loop of TssJ (Felisberto-Rodrigues et al., 2011). The TssM has been recalcitrant to structural biology, but the group of Christian Cambillau recently succeeded to obtain crystals of its periplasmic domain by using TssM-specific camelid nanobodies (Nguyen et al., 2015a). One of these nanobodies competes with TssJ for binding on TssM, and we showed that, in vivo, the presence of the nanobody in the periplasm prevents formation of the TssJ-TssM complex and inhibits the proper assembly and function of the T6S apparatus (Nguyen et al., 2015b). The use of these nanobodies facilitated the crystallization of a fragment of the TssM periplasmic domain, alone and in complex with the TssJ lipoprotein (see below). Finally, bioinformatics analyses showed that the tssL gene co-occurs with tssK, suggesting that the two corresponding proteins are intimately linked. Indeed Rahim found that the cytoplasmic TssK protein interacts with the cytoplasmic domain of TssL (Zoued et al., 2013). Eric showed that the purified protein behaves as a trimer and used electron microscopy and small X-ray diffraction (SAXS) analyses to define the overall structure of TssK: a pyramid with three extensions. 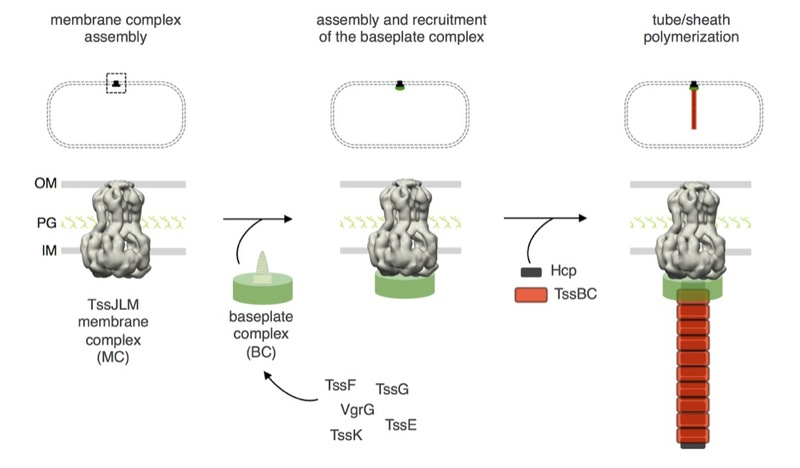 Recently, the group of Sarah Coulthurst proposed that TssK is a component of the T6SS baseplate (English et al., 2014), in agreement with our interaction studies showing that it interacts with the Hcp and TssC tail subunits as well as with the TssFG baseplate components (Brunet, Zoued et al., 2015). Based on these results, we suggested that TssK links the T6SS membrane and tail complexes. A summary of the current knowledge on the T6SS membrane complex is shown below. (A) Localization, topology and structure of the T6SS membrane-associated subunits. (B) Schematic representation of the interactions between T6SS membrane complex subunits (Zoued et al., 2014). To gain insights onto the biogenesis of the TssJLM membrane complex, Rahim inserted the gfp gene at native chromosomal loci to engineer strains producing the TssJ, TssL and TssM proteins fused to fluorescent probes. Fluorescence microscopy studies of strains producing the functional GFP-TssL and GFP-TssM fusion proteins showed that 1-3 membrane complexes assemble in each cell, at random location, and that these complexes remain static. Using mCherry fusion to the TssB sheath protein, Rahim further demonstrated that the T6SS tail uses the TssJLM complex as docking station and that these anchoring stations might be used for several rounds of tail assembly and contraction. By monitoring fluorescent TssL/TssM cluster assembly in various mutant backgrounds, he further delineated the assembly pathway, showing that TssJ initiates the assembly of the T6SS that then progresses inwards by the sequential addition of TssM and TssL (Durand et al., 2015). Eric purified the TssJLM complex to homogeneity and showed that it assembles a 1.7 MDa complex comprising 10 copies of each protein (stoichiometry 1:1:1). 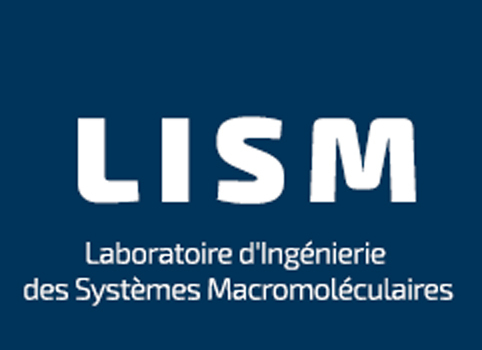 In collaboration with the group of Rémi Fronzes (Pasteur Institute), Eric imaged the TssJLM complex by negative stain electron microscopy and reconstructed the structure at 11.6 A resolution. By combining these data with the low resolution structure of the TssM-TssJ complex obtained by SAXS and the high-resolution structure of the C-terminal fragment of TssM bound to TssJ obtained by Son, we showed that the TssJLM complex is formed by a cytoplasmic base from which starts ten arches constituted of the periplasmic domains of TssM. Five of these arches gathers to the of the structure, therefore forming a cap composed of two layers of five pilars composed of the C-terminal domains of TssM and TssJ (Durand et al., 2015). We are now progressing to get better resolution of the membrane complex by cryo-EM, and imaging the complex in vivo by cryo-tomography in collaboration with Martin Pilhofer (ETH Zurich, Switzerland). 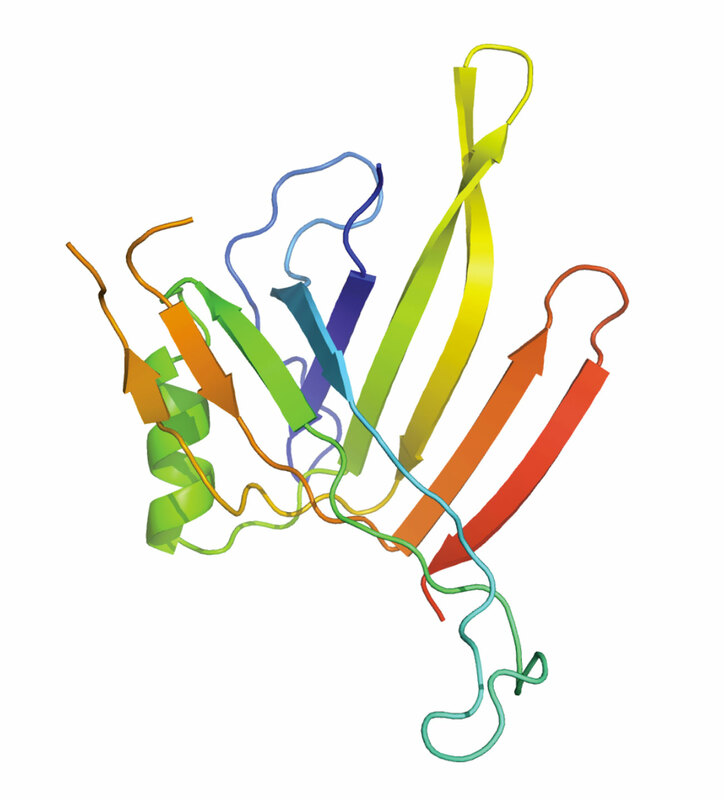 We initiated our studies on the tail complex by working on the Hcp protein. The Hcp proteins were previously shown to form hexameric rings. In several instances, short tubular structures were observed by electron microscopy, suggesting that the Hcp rings stack on each other to assemble tubes. However, the formation of tubes was not formally demonstrated in vivo. In collaboration with Jérôme Hénin (IBCP, Paris) we used molecular docking and modeling to identify Hcp-Hcp contacts if rings stack on head-to-tail, head-to-head or tail-to-tail organization. By using cysteine substitution to probe disulfide bond formation in vivo, Yannick found that that Hcp rings form tubular structure with head-to-tail organization (Brunet et al., 2014). Interestingly, he also observed that this organization is controlled by the other subunits of the T6SS as, in absence of T6SS, Hcp rings assemble in head-to-tail, head-to-head and tail-to-tail conformations. During the same period, we obtained crystals of the Hcp protein. However, because of this difference in packing when produced in absence of other T6SS components, we did not succeed to solve its structure. To circumvent this problem, we positioned tryptophan residues at the Hcp-Hcp ring interface to prevent contacts between the rings and formation of different assemblies. 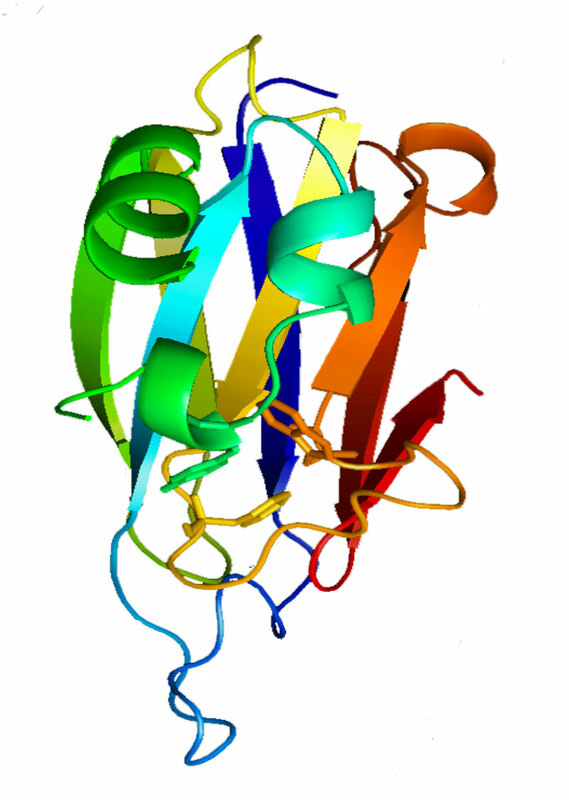 Badreddine then obtained crystals, solved the structure of the substituted Hcp protein and showed that Hcp rings stack on each other with a KD of 7 µM (Douzi et al., 2014). The sheath is composed of two proteins : TssB and TssC. 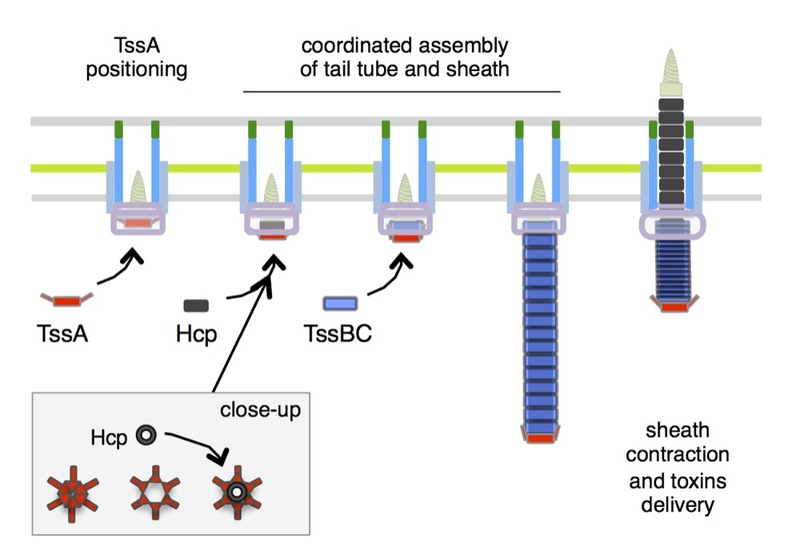 By using a fusion between TssB and the Green Fluorescent Protein (TssB-GFP) we were able to follow the dynamic of assembly of the sheath : elongation, contraction and disassembly. Yannick showed that polymerization of the sheath depends on Hcp tube formation, the incorporation of a Hcp hexamer preceding that of a sheath brick. By using bacterial two-hybrid experiments and co-immunoprecipitation, he reported that Hcp makes contacts with TssB (Brunet et al., 2014). Xiang and Laureen worked on the interaction between TssB and TssC. Xiang found that TssC interacts with a long helix of TssB located close to the C-terminus of the protein. By using targeted mutagenesis, he identified the face of the TssB helix interacting with TssC (Zhang et al., 2013). Laureen also showed that the C-terminal helical hairpin of TssB is required to interact with the outer surface of the Hcp ring. 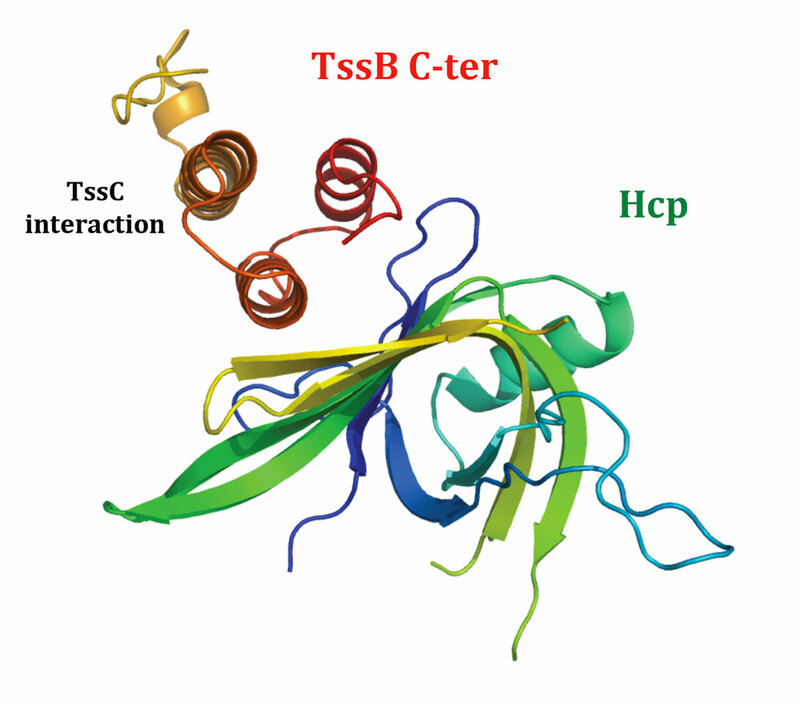 More recently, Badreddine solved the structure of a C-terminal fragment of TssB that contains the three helices required to interact with TssC and Hcp. Representation of the Hcp / TssBC-ter interaction highlighting the contacts between the TssB C-terminal hairpin and the Hcp outer surface. The site of interaction of TssC on TssB is also indicated. In phages, inner tube assembly is controled by a structure, called the baseplate – or assembly platform. The minimal phage baseplate requires 5 components : gp6, gp25, gp53 and the gp27-gp5 spike. This elements are conserved across contractile taill structures. Based on the homologies between the T6SS and contractile tails, it has been proposed that the T6SS tail tube and sheath assemble on such a platform. 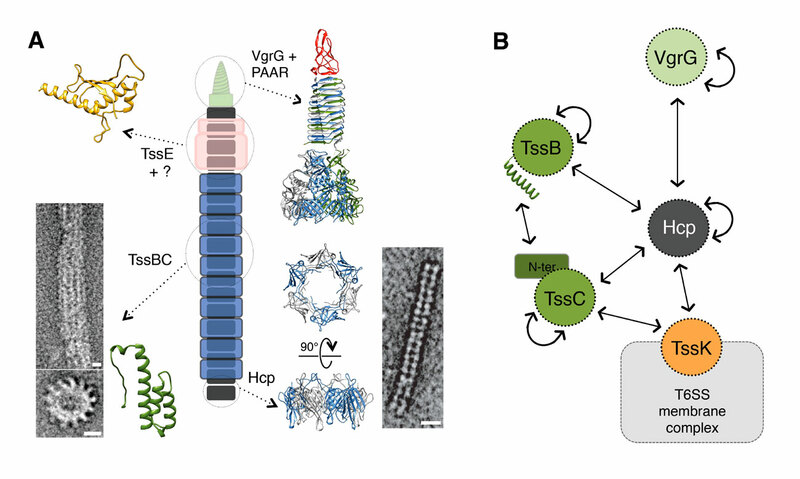 Indeed, cryo-tomographs of the T6SS in V. cholerae cells suggested the existence of a bell-like structure connecting the membrane complex to the tail (Basler et al., 2012). By using the Hcp cross-link assay, Yannick showed that 6 of the 13 T6SS core components – TssA, TssE, TssF, TssG, TssK and VgrG – are required for proper Hcp tube formation. Yannick then characterized these proteins. He found that TssE, -F, -G and VgrG interact and likely form a complex with a function similar to phage baseplates. Indeed, in addition to TssE and VgrG that are structural homologues of gp25 and gp27-gp5, Yannick and Frédéric found that TssF and TssG share limited homologies with gp6 and gp53 respectively (Brunet, Zoued et al., 2015). Using time-lapse recordings of cells producing chromosomally-encoded sfGFP-TssF (or –TssK) and TssB-mCherry Rahim showed that the TssF and TssK assemble stable and static foci on which the T6SS tail sheath polymerizes. 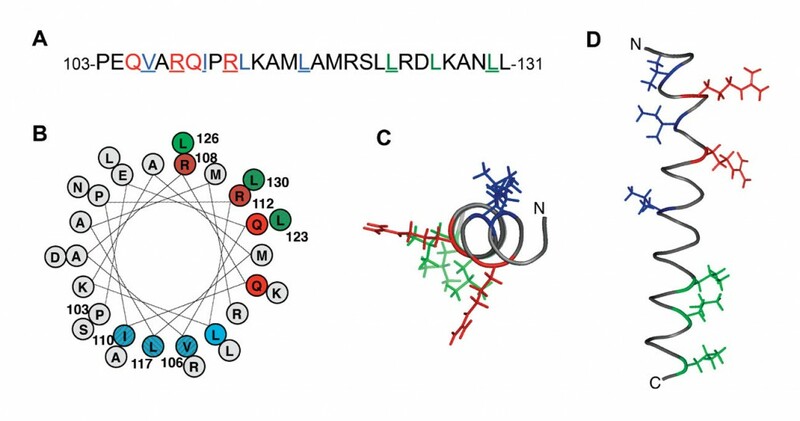 Taken together, all these data demonstrate that the TssE, -F, -G, -K and VgrG subunits assemble a complex evolutionarily, structurally and functionally similar to phage baseplates. Finally, using fluorescence microscopy, bacterial two-hybrid, fractionation and co-immune precipitation assays, Yannick and Rahim demonstrated that the TssEFGK-VgrG baseplate is recruited to the TssJLM complex via multiple interactions, including contacts between TssK and TssL, TssK and TssM, and TssG and TssM (Brunet, Zoued et al., 2015). Schematic representation of the different stages of T6SS biogenesis. 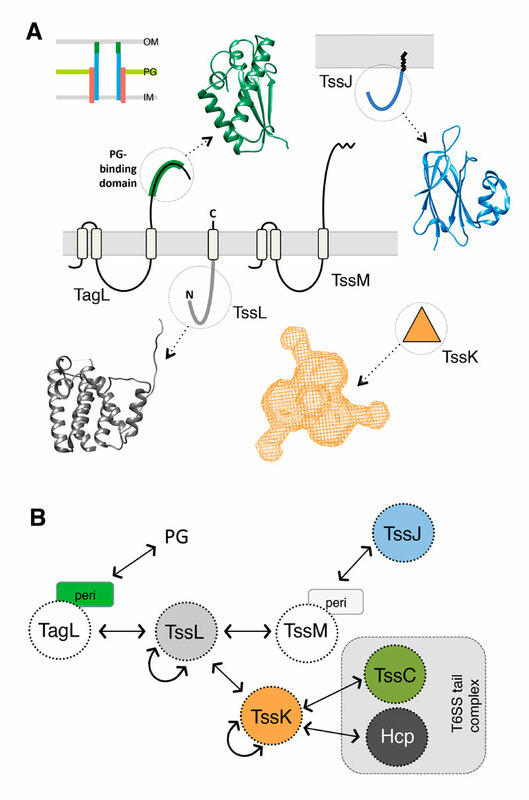 The TssJ-L-M membrane complex is first assembled in the cell envelope (IM, inner membrane; PG, peptidoglycan; OM, outer membrane) and recruits the baseplate-like assembly platform constituted of TssE, TssF, TssG, TssK, VgrG and possibly TssA (platform represented as a green disk with the VgrG green screw). Polymerization of the tail tube (Hcp rings, black rectangles) and sheath (TssBC strands, red rectangles) is initiated after completion of the platform (adapted from Brunet, Zoued et al., 2015). Further experiments also showed that, although TssA is required for Hcp tube polymerization, it is not a component of the T6SS baseplate per se. Interestingly, Rahim found TssA in a bacterial two-hybrid screen to identify components that interact with both inner tube and outer sheath. These components might be involved in priming tube and sheath polymerizations, coordinating the assembly of the tail, arresting tube/sheath polymerization or keeping tube and sheath attached together to prevent energy dissipation during sheath contraction. Using a combination of fonctional, genetic, biochemical and fluorescence microscopy assays, Rahim demonstrated that TssA first binds to the membrane complex and recruits baseplate components. TssA then primes the assembly of both the tube and the sheath. However, TssA does not remain associated with the baseplate but conversely, stays associated with the distal end of the growing sheath (see Figure below), suggesting that it coordinates the polymerization of the sheath with that of the tube (Zoued, Durand et al., 2016). TssA dynamics. (A) Time-lapse fluorescence recordings of wild-type cells producing TssB-mCh (red) and GFP-TssA (green). A schematic representation of the events are shown below. (B) Kymograph analyses of the sheath and TssA dynamics. Using electron microscopy, small angle X-ray scattering and X-rays in collaboration with Christian Cambillau and Rémi Fronzes, Eric demonstrated that TssA oligomerizes to assemble a dodecamer with a 6-arm starfish-like structure (see Figure on right). A deletion study coupled to docking and modeling simulations further showed that the TssA central core contacts the Hcp inner tube whereas the arms tightly interact with TssC and are interdigitated with the last row of sheath subunits in the extended conformation. Finally, the X-ray structure of the TssA central core shows a unique fold: an hexaflexagon, a kaleidocycle with 6 pyramidal wedges associated with each other via hinges (Figure on right). TssA structure. 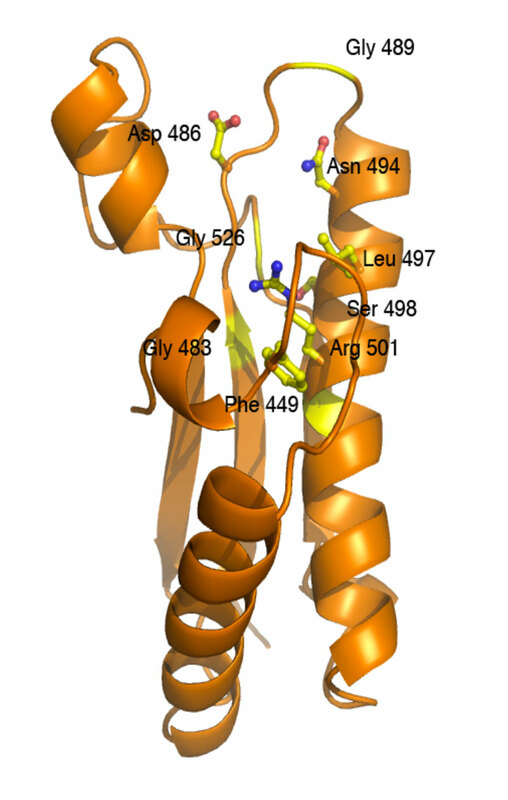 On the left is shown the SAXS low-resolution structure of the TssA dodecamer highlighting the 6-arm starfish-like structure. The high-resolution X-ray structure of the hexaflexagon central core, with the 6 pyramidal wedges, is shown on the right. Model for TssA function. TssA positions first on the membrane complex and recruits the baseplate. It then primes and coordinates tail tube and sheath polymerization, and maintains the sheath under the extended conformation. TssA remains associated to the sheath during contraction to prevent energy dissipation. Based on this unique structure, we propose that the wedges can move outward, hence opening a lumen compatible with the passage of Hcp hexamers. In our working model (Figure below), TssA primes and coordinates tail tube/sheath polymerization by adding sequentially Hcp rings and sheath rows from the distal end. By interacting with the rigid inner tube and the last row of sheath, TssA maintains the sheath under an extended conformation. After tail completion, TssA remains at the tip of the structure and prevents energy dissipation during contraction by keeping the distal end of the tube attached to the sheath until the last row contracts (Zoued, Durand et al., 2016). Taken together, all the data converge with a biogenesis pathway in which TssJ positions the site of assembly of the T6SS and then recruits TssM. TssM recruits both TssL and TssA. 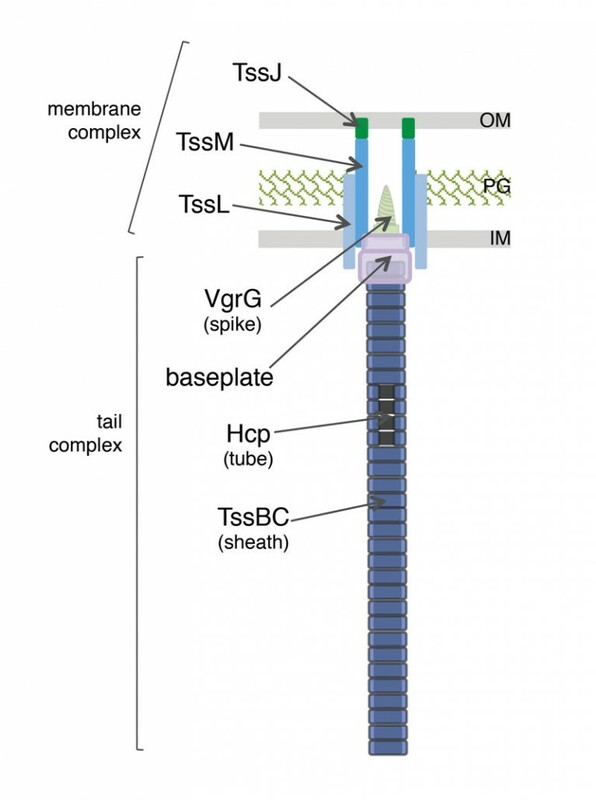 The TssEFGK-VgrG baseplate complex docks to the TssJLMA-membrane associated complex, and the coordinated polymerization of the tail tube and sheath is initiated. The assembly pathway of the T6SS. A summary of the current knowledge on the T6SS tail complex is shown below. (A) Schematic representation of the T6SS tail. The localization and structure of the subunits are shown. (B) Schematic representation of the interactions between T6SS tail complex subunits (Zoued et al., 2014). For further information, we refer to recent reviews on the assembly of the T6SS from our group: Cascales and Cambillau, 2012; Silverman et al., 2012; Zoued et al., 2014.